One thing Atari became famous for over the years were its prototype games. As we celebrate 40 years of Atari this month, it is a fascinating avenue to go down. Many never made it past the paperwork and brainstorming sessions but some made it far enough to have a cabinet created and location tested. Poor testing shelved many of the titles you will see below. If you are interested in prototypes for old Atari consoles then there is no better resource than Atariprotos.com. They don’t cover arcades but do cover the Atari 2600 – Atari 7800 as well as the 8-bit computers. There is a lot of ground to cover on their arcade prototypes, so lets get started. 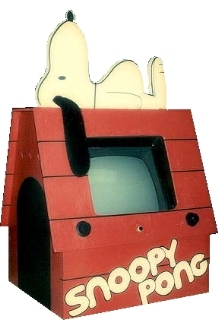 Among the first prototype games that never were released was Snoopy Pong. The plan was to use the famous cartoon character from Peanuts by Charles Schultz but it wasn’t licensed or authorized by the author and after he threatened a lawsuit, the project was cancelled. They then went on to create Puppy Pong but this didn’t test too well at Chuck E. Cheese’s and so it was cancelled as well. These were not the lone Pong prototypes – as many companies were showing up overnight with their own Pong clones, Atari sought ways to offer the same game in a unique cabinet that would cater to particular venues and stave off some of the clones. Another interesting cabinet was Pong-In-A-Barrel, which was made out of wine barrels but they came apart so it never reached full production. It was not the same as Barrel Pong which used a different design. For a little further down the road I’d recommend this article on Atarigames.com – May 1976 Game Ideas. Some of them made it to completion, others not so much. The Anti-Breakout mentioned could have eventually turned into Avalanche. Cannon Ball is mentioned, the first project Owen Rubin worked on while at Atari and was also among the first CPU games they were working on. While Cannon Ball was not released to arcades, it was released to the Atari 2600 a couple of years later. The City Driver game mentioned could be what Super Bug (1977) became as the concept sounds similar. Sometimes concepts just weren’t fun and the limitations of the technology didn’t help much. Another game worked on by Owen Rubin called PT Commander sounds like it fell into that “not fun enough to release” trap. A game called Boxing went through various hardware adjustments to make the controls durable enough but once the game made it to test, it didn’t earn well enough. The concept was eventually released through Activision on the Atari 2600. What I always enjoy the most about prototypes though are unique cabinet designs or technologies that they tried to apply to a game. Take games like Wolf Pack, Sebring and Qwak. 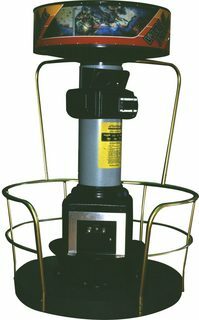 Wolf Pack used a periscope viewer that rotates around a monitor located in the bottom of the cabinet – it reminds me of the Turret Tower concept minus the moving platform. Had this game been released in 1978 it would have been the first to feature digital voice, two years before Taito made Stratovox. Sebring (1979) was another title by Owen Rubin and Jed Margolin. 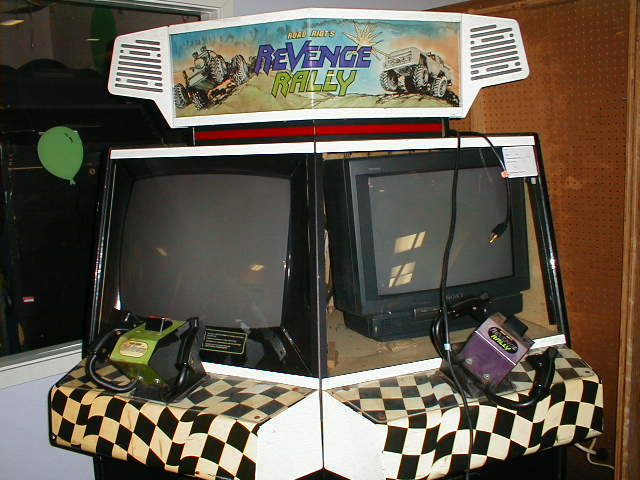 It was a racing game that had multiple hardware features to it that were unique for the time – it was a sitdown cockpit cabinet that used a curved projection mirror to create a different way of displaying the image from the 25″ color monitor that was mounted in the top of the cabinet. 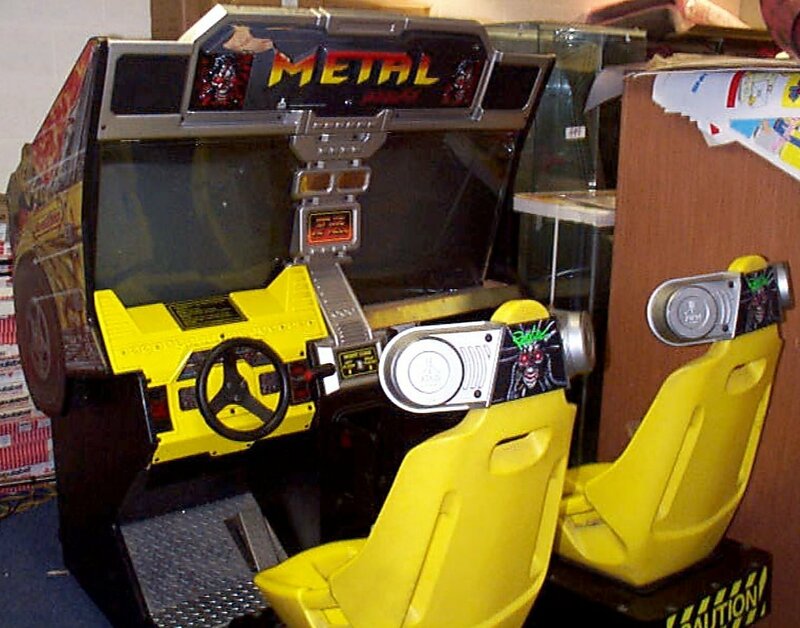 It had scaling graphics and sounds like it was a first person Pole Position, the game began by starting the engine and a speaker was placed under the seat to give the players a buzzing feel from the engine. 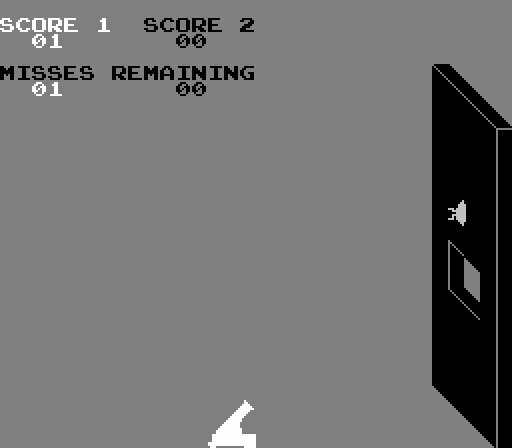 Qwak (1982) was a game by Mark Cerny and it first tested out touchscreen technology for a puzzle game (it does share a name with Atari’s first light-gun title). Slide the pieces around to help the Mother Duck and her ducklings reach the river. Here’s a video of that one in action and if you would like to see the hardware, Atarigames.com has the pics. The 80s would see Atari grow in every division and with growth came even more arcade concepts, some would get a release but many would not. You can read some brainstorming sessions from Atari in 1980 where they came up with the first concepts that would become games like Tempest and Liberator. They really wanted to pull off some ideas using a 1st person perspective. Session 1 and Session 2 for some interesting concepts they were thinking about. This page on System16.com also has some details on various prototypes from the 80s including minor details on an E.T. arcade that would have been different from the home version. Another puzzle game that just didn’t make it to the final release phase would be Runaway (1982). You have to move train track sections around to get the train to grab the mail bags while avoiding other obstacles such as other moving trains. Atarigames.com has a fascinating Focus Group and location test report where the issues with this game came to surface, mainly that it was too easy, the controls and the graphics needed improvement. Speaking of strange, Atarigames.com has footage of a prototype called Harescare where you control a box that can lay mines in fields. You lay mines for the foxes that come into the fields and you can also grab the roaming rabbits to put them into a truck. The concept is kind of like what they did for Gremlins on the Atari 5200, minus the mines. They have a lot of footage not found anywhere else of Atari prototypes – this unknown game that is like a cross between Tank, Centipede and Robotron; Jammin which was an early attempt at rhythm gaming; Accelerator, a 2 player space racing game where the screen was divided up like Xenophobe and your space ship rides on a pipe of some kind(seems like this one would have benefitted from a dual monitor widescreen); BMX Heat which used the Hard Drivin’ 3D hardware and it would have been an “exergame” as the player would sit on a BMX bike and pedal to move the virtual bike around the track; and finally Mean Streak, which was a vehicle combat game they slated for a release after California Speed. One of Atari’s bigger names almost got a direct sequel in 1982 but it just didn’t work out, even after changes made to it from testing. 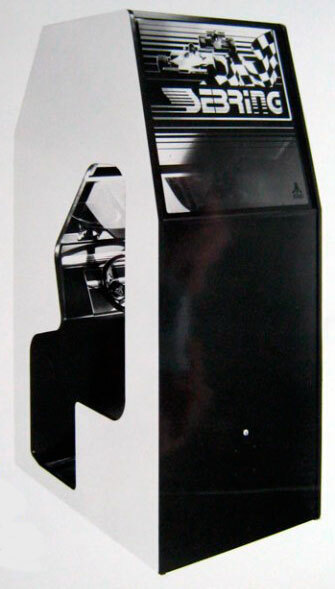 Missile Command 2 would have allowed co-operative and competitive play using the MC concept with a unique kind of cocktail cabinet that used a curved mirror. In a way MC still got a sequel in 1982 with Liberator, which is a first-person Missile Command in reverse. MC2 will be seen in public for the first time in decades at the upcoming California Extreme show this summer. Atarigames.com has more info on this one including test reports where players complained it was too easy. Also this video below offers a preview of the game which will be at CAX. Inspired by the Dragonriders of Pern (it was supposed to be that but the licensing fell through), Dragon Master/Firebeast (1983) is a colorful game that is kind of a tower defense sort of title, although it was obviously inspired by Exidy’s popular Crossbow. Dwarf miners walk from one side of the screen to the other and you control a wizard riding a dragon that has to protect them from strange energy beams that fall from the sky while also protecting them from attacking creatures. It even has a Dig Dug element to it at one point. Also in 1983 was Cloud 9, a strange weather related shooter where you blast clouds. This was originally supposed to have been a project for Dona Bailey who worked on Centipede but Paul Resch picked it up after she left Atari. Prior to getting out of the vector business, there was Tomcat, a first person flight combat simulator more advanced than Red Baron. Designed by Jed Margolin who had to shelve it after Atari wanted Firefox to be done, thus making it the last vector game worked on at the company. It was more of a research project at the beginning anyways but would have been a simulator with a moving seat and it had helicopter and fixed wing planes to control. More info on it can be found here. Atari released their first laserdisc game in 1983 called Firefox but the bottom fell out of the laserdisc craze almost as quickly as it had arrived. This left prototypes like Battlestar Galactica in the dust, which was actually being made as a conversion kit for Firefox. That was also affected by Atari’s internal changes at the time as 1984 was the transitional time where the arcade side was about to turn into Atari Games. Here is some footage of that game, which starts out with promotional material and then it turns into a collection of clips the game would have used. It is not actual game footage in the sense of this being patched together seamlessly with game code. Atari also tested out a Knight Rider concept using laserdiscs and proposed an Indiana Jones game using the technology. They would end up releasing Indiana Jones and The Temple of Doom on traditional hardware in 1985. Speaking of that, here is footage from the first version of Road Runner which used laser disc hardware. It looks like a lot of fun and a version very similar to it was released a couple of years later but without the cut scenes. I imagine that the Indiana Jones game would have done the same thing had laserdiscs worked out. Here is footage from Golf Trainer, which was also in development around 1984 before getting the axe. This was worked on by Owen Rubin who was sent to MIT by Atari to study laserdisc technology which he recommended that they not use but they went ahead with this and the other laserdisc games mentioned above anyways. This is like concepts that came along years later for golf simulators, as this had players hitting real golf balls into a projection screen and sensors would detect the speed and angle of the ball and project that into the game. Another idea ahead of its time. A project that would come along not long after they killed the laserdisc but was based on a movie was Gremlins. Atari did create some Gremlins titles for the Atari 2600, 5200 and 8-bit computer platforms (the 5200 version is excellent but it’s hard to find) but this one wouldn’t make it to the market at the end of the day. Before finishing out the 80s another game worth mentioning was a prototype of a couple of Atari pinball games. Atari produced the first solid state pinball with The Atarians back in 1976 and after that they made some interesting pins such as Hercules, one of the largest commercial pinball machines ever produced that used cue balls as opposed to standard pinballs. Sometime in 1983 a design was made for an E.T. pinball. As E.T. collapsed on the gaming market (Atari wasn’t faring to well with their pinball games either) the design was reused for a different theme, 4X4. 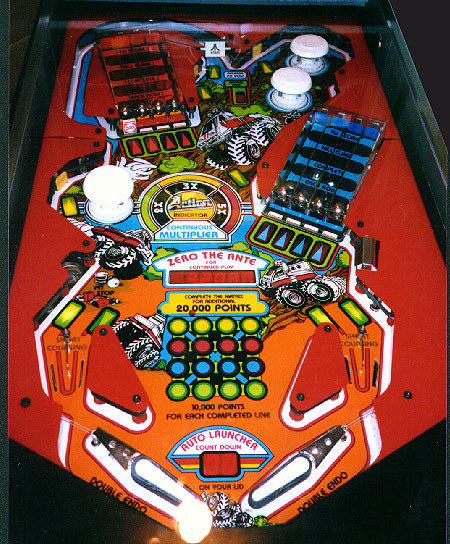 Only two 4X4 pinball machines are known to exist and for a pre-ramp pinball it looks pretty fun. Atarigames.com has pictures. There was at least one more pinball prototype made called Neutron Star but it never made it past the whitewood stage. The 80s were loaded with prototypes but the 90s wouldn’t be lacking in this regard either. Another sequel project that was canned, due to the rising popularity of fighting games was Marble Madness II – Marbleman (1991). This differed in one great aspect from the original – it used joysticks instead of trackballs as Atari felt that the trackballs might have held the original back from greater sales. It also supported up to three players and a new “superhero” character, hence the Marbleman. They also gave the marble new abilities like invisibility and flight and it had some video pinball levels as well. The game made way for Guardians of the Hood which didn’t do too bad for the company being one of the few brawlers Atari would release. Which reminds me of a brawler game I wish the console side of Atari had released, Conan for the Atari Jaguar which looked like it would have been arcade quality had it been finished. 1992 saw a few of games go to the wayside. Atari Arcade Classics was created to celebrate 20 years of Atari and included new versions of Centipede and Missile Command called Super Centipede and Missile Command II. Both games were co-op games too which would have been a feature seen in the Atari 7800 version of Centipede at least. The same hardware for AAC was used for a cancelled puzzle game called Dr. Sparkz Lab. Atari had some success in the market with their 3D simulator Hard Drivin’ and in 1993 they prepped a third installment to that series with Hard Drivin’ Airborne. 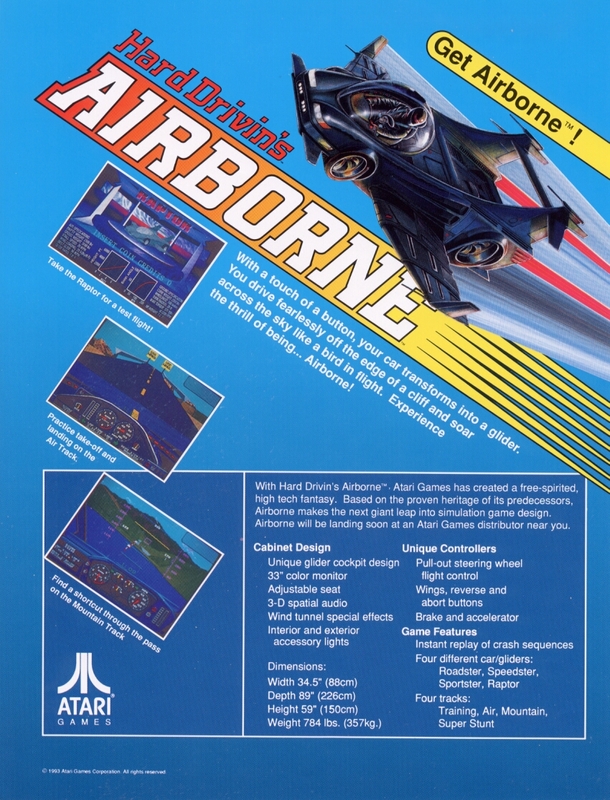 The game focused on hitting huge jumps where you could turn your car into a glider. The cabinet also would reflect this change offering a complete redesign with a 33″ monitor, a cabinet shaped as a “glider cockpit” and it also had “wind tunnel special effects” which I assume to mean was a fan system. The flyer for the game can be seen below(or through this link, KLOV entry with some details here. Atarigames.com also has some memos on the project. 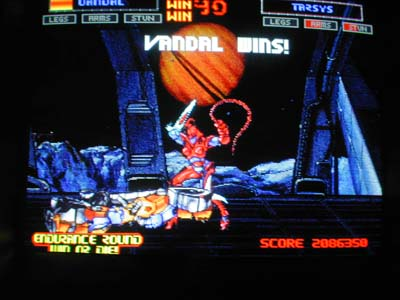 Continuing on with the 3D developments came Metal Maniax (1994). The hardware used to power this was nothing short of crazy, featuring 8 CPUs and hundreds of other chips to pull off textured polygons. The game itself was a vehicular combat game, along the lines of a demolition derby. It turned out that the game was too ambitious for the complex and expensive hardware and it suffered from an inconsistent frame rate which is not something you want to release a big expensive arcade game with. This caused problems with the location tests and it was cancelled shortly after that. A dual player cabinet was created for it, which is slightly similar to the idea they used with T-Mek . It also used their CAGE sound chip which made for some incredible sound behind T-Mek and Primal Rage. More info on the hardware at System16. Growing up in the 90s you probably heard of Beavis and Butthead even if you didn’t have MTV at home. A number of B&B games were released for home consoles but at some point it was decided that an arcade game would be suitable as well and Atari Games was brought on to do it. Using modified 3DO hardware, a home system quite pricey itself, some prototype cabinets of the game were made but the game was never fully finished. The mid-90s were a time where one on one fighting games were the order of the day and after PitFighter Atari Games found some success with their dinosaur combat game Primal Rage. A couple of years later in 1996/97 Primal Rage II was in the works as a follow-up but it was ultimately cancelled. This would have had a six button layout like Street Fighter II and now you would select a human who could turn into one of the dinosaurs from the first game as a part of their attack combos. The human worshipers were still present as was the violence along with improved graphics. More pictures over at Unseen64.net. Another unreleased game that used the same hardware was a flight shooter called Die Alien Scum!!. Well I hope you enjoyed that extensive look at the prototypes of Atari. I know I didn’t cover every single one, but for the remainder so little is known about them that it’s not worth the trouble anyways. Prototypes are a window into what could have been, although at times it was obvious that the concept just wouldn’t work, which is why it was cancelled in the first place. This also allows me to answer a few questions about the Atari Timeline published earlier. Regarding those games included as ‘Prototypes’ I was careful only to add games that went to ‘stage two’ development (mock-up cabinets and LocTest). As you can see above there are a number of Atari concepts that only were ever realized on paper – and it was best to just focus on the fully fleshed out ideas that never were released. Regarding the question of other manufacturers time lines – System16.com dose a great job of listing the majority of each factories output – though we may differ on detail, but sadly unlike Atari most Japanese developers have a zero tolerance policy on prototype recording outside the company. I had no idea they were so plentiful or available! Thanks so much for the mega post. Thanks for sharing that info Brian. 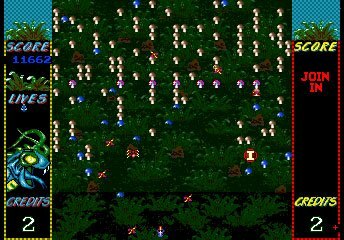 I had found a video online of Cannonball but the graphics were completely corrupt. I’ve always wants to see footage of a lot of these games (especially Sebring to see how the projection mirror effect worked exactly) but that is always difficult. I was trying to find someone who had recorded Die Alien Scum at CAX06 but all I could find were people walking the floor quickly. As far as I know Gremlins on Atari 5200 was never released in stores, but maybe I just never saw it? I discovered it in 1986. When Atari sent me a printed brochure I asked for to reorder the 5200 controllers. Which had broken for the third time. I noticed a list of games you could order. I had them all and when I got to the bottom. I saw Gremlins. for $9.99. I was surprised. At this point they weren’t releasing games for the 5200. The last two games released had been Ballblazer and Rescue on Fractalus. I ordered it and it came sealed with the box and everything. Wish I had kept it. It might be worth something today. So anyway. I played it and I liked it. The story of what happened to Gremlins is here: http://www.atariprotos.com/5200/software/gremlins/gremlins.htm The game was ready in 1984 but shelved because of Tramiel but when they started clearing out warehouse stock they offered it through mail order in 1986. Interesting little story. I’ve actually never come across it on the 5200, just an 8-bit conversion which was excellent. Wish those games were completed, they look cool. I also hope that atari games would come back, I miss them so much! BRING BACK ATARI GAMES!!! BRING BACK THE MASTERPIECE THAT IS RUSH 2049!!! @moonkeybroly – I hear you brother, I was a serious RUSH fan – hated it on the consoles – loved it on the arcade. I was lucky enough to be living in California at the time, near a arcade that had a WAVENet set-up (testing); loved playing the development team sitting in Glendale, while they were in San Jose! I would love to see more Hot Rod Rebels footage. It stinks that it was never completed. At least there’s Nitronic Rush. Google it, it’s a great mix of Rush 2049’s stunt mode with the graphics of Rez. The 1980 brainstroming sessions dont work, any idea on how to find these brainstorming sessions?